On our last GreenTEAM blog post, we received a great comment from Aaron, who gave us some wonderful ideas on how to make our StuartCo sites even more green. Thank you Aaron for taking the time to share with us how you GoGREEN, and for educating us on how we can participate as well! I would recommend making people aware of renewable energy programs and energy efficiency programs. I have found a number of computers and printers placed next to the metal recycling bins in the garages. I’m thrilled that people understand the value of recycling old electronics! 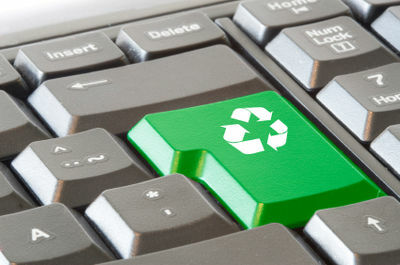 However, they’re not aware that placing electronics with other recyclables isn’t the proper way to dispose of them, because many electronic items contain hazardous materials. Instead, they must take their old electronics to a designated recycling facility. Additionally, Aaron provided with a helpful link to educate us on what electronic waste is, why it is a problem, how to dispose of it and more. We also did a little research, and for those of you that live in the Hopkins area, this Saturday (the 21st) they are hosting what they call a Tech Dump. It’s entirely free, and they’re accepting many different items. Bring in old game consoles, cellphones, laptops/desktop computers, and many more. See this flyer for more information on location, time, and a full list of what electronics you can and cannot bring. As always, most Best Buy and Target stores offer small electronics recycling stations near the entrance. We love getting ideas like this one from Aaron, so please, if you have something you would like to share, leave us a comment!